The last couple of days were rough, and I’m physically and emotionally drained. Still, the last thing I wanted to do was sit around and mope. It’s a spring-like 60 degrees today with another major winter snowstorm heading our way tomorrow. Just enough time for a mini renovation project. I really need to replace the inner-workings of my toilet, since it leaked an excess of 750 gallons of water in the last two months. But plumbing just isn’t as therapeutic as painting. So painting it is! 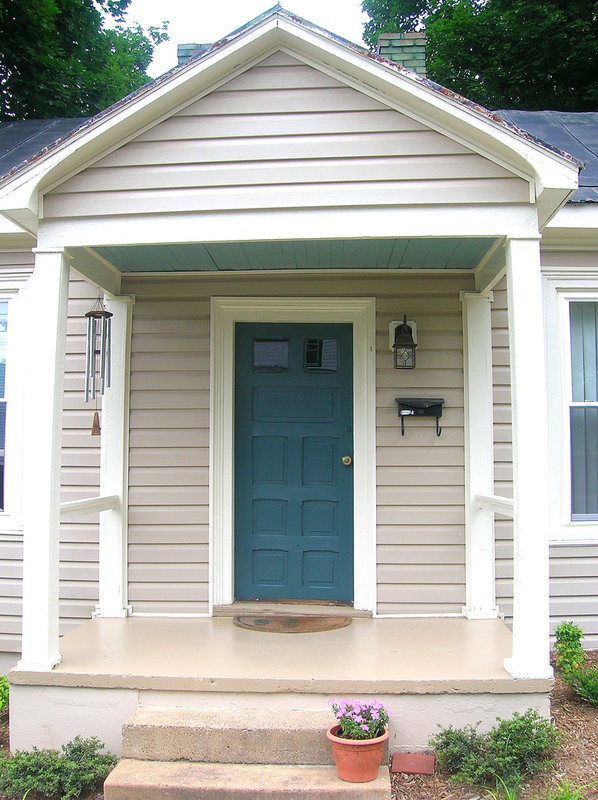 And what’s more perfect for a small painting project than the front door. 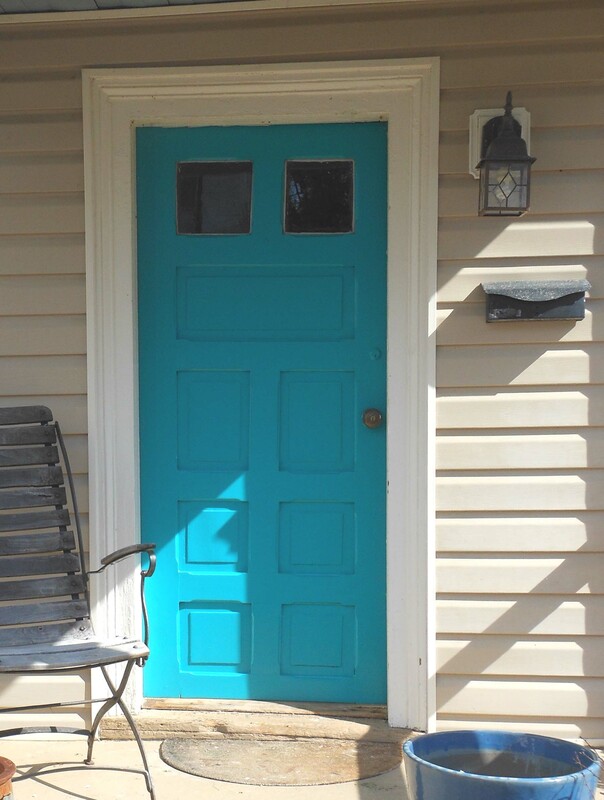 I really like the teal color I chose for the door a few years ago, but it was getting ragged looking. And it really needed it a little zip. I floundered between staying in the blues or moving into the reds, and finally settling on a bright turquoise blue. I can’t find the words to express just how horrible that choice was. 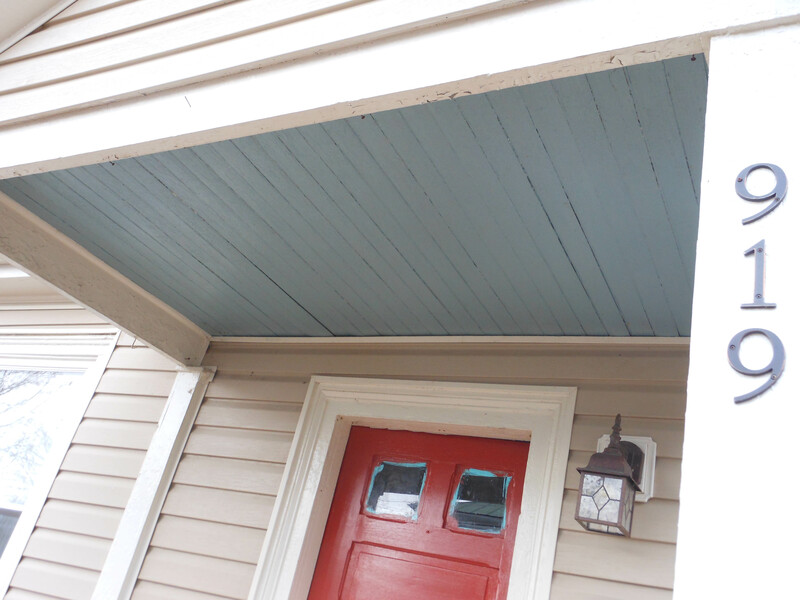 The color is bright, garish, and completely clashed with the warm undertones of my trim, roof and siding. [Next to the door, my siding took on an eerie purple tone. Have I mentioned how much I dislike purple?] I tried softening it up with white, but no go. The thing about color is that you can love it to pieces, but if it’s wrong for what you’re doing, it’s just wrong. Just as I convinced myself to let the color grow on me, my neighbor walked over, gave it a quick look and pronounced “That’s gotta go!” I hated to admit it, but she was right. Back to Plan A. My original idea was to go with a deep rosy red. 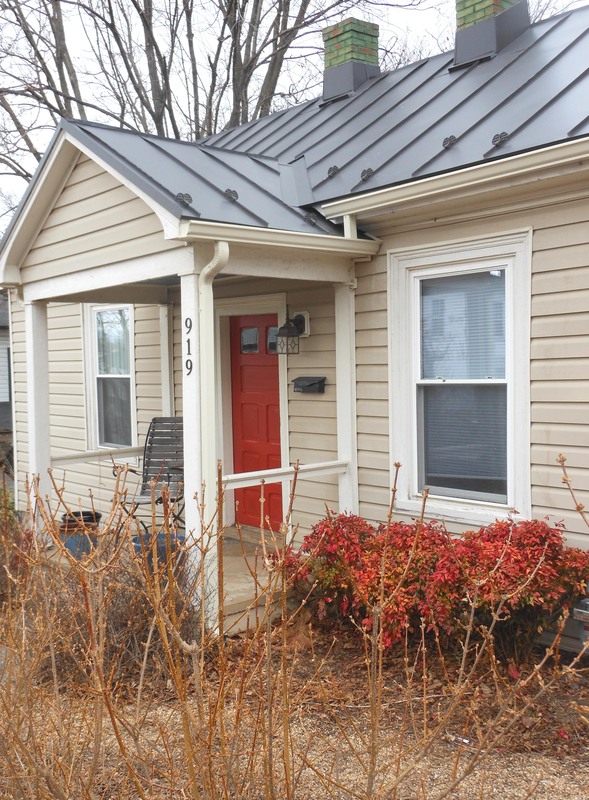 Still, my gut told me that the pinkish hue would not complement the (now purplish) beige siding. The other option was to go more orange, which is the color I used on my herb box, as well as the wintertime hue of the Nandina bushes lining the front of the house. Bingo! It’s going to take a bit of time before this 1st red coat is cured and ready for a second, and to scrape the paint from the windows. 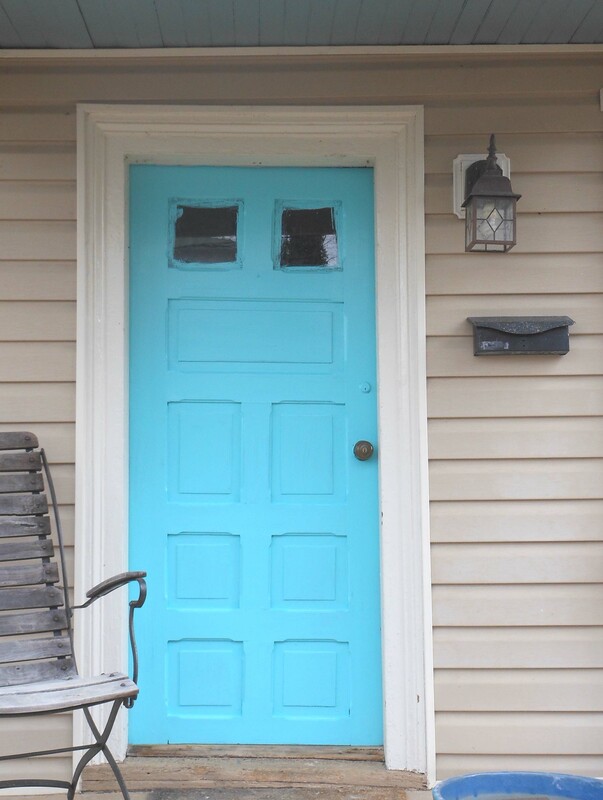 But I’d rather look a turquoise-trimmed windows than that awful blue door any day. 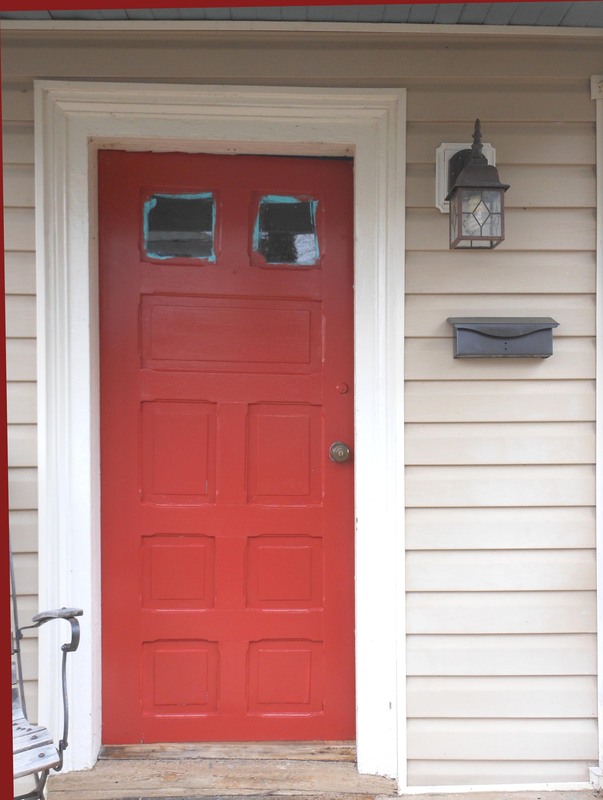 Pretty new door and freshly painted mailbox. Note: all is not lost for the remaining blue paint. While it failed on the front door, it will be brilliant on the stoop ceiling. I love a happy ending. I think the red door is just perfect with the new roof color. The house really looks good! Yep, that red is a great color for your house. I do love a good turquoise too. You’ll just have to paint something inside! Maybe this will inspire me to finish painting Helen’s furniture. We got her bed done but nothing else so far.